Paste intern Adreon Patterson shares his thoughts on seeing Ryan Coogler’s blockbuster for the first time. As a Black American male, the release of Black Panther was more a validation of Black culture’s global impact than a simple popcorn blockbuster. My preparation for this film was a year in the making. From the involvement of director Ryan Coogler to the gorgeous images and teasers to the spectacular trailers, my anticipation grew month by month as I hadn’t experienced this type of hype for a full-on Black production since 1998’s Blade. Seeing a film of this scale in 2018 shouldn’t be a rarity but the norm. 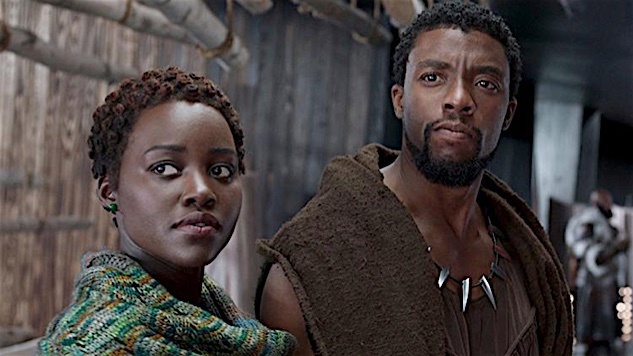 Unfortunately, I’ve heard my favorite Black actors and actresses say repeatedly that studios are afraid to put money behind films with a predominately Black cast because “they don’t sell internationally.” Given that, at time of publishing, Black Panther has pulled in $228 million internationally—so much for that theory. As for the film itself, I went into it hoping for a great experience but with low expectations (plus it’s Black History Month so I had to support the culture). After all, big studio films rarely ever capture the nuance and subtlety of Black culture, but nonetheless, I was still hyped on Sunday morning as I prepared for the event of it all. Looking at friends’ photos in African garb or exciting posts about the film made my inner Marvel fanboy jump with joy. This was my inspiration as I put on my black boots and pants and gray Black Panther shirt in preparation for my own Black Panther experience. My excitement for the film grew as I drove to the movie theater and turned into heart palpations as I saw the film’s name posted outside the theater. Inside, I encountered a lobby filled with Black and brown people sitting around waiting to see a film. As I munched on some fries, the film began, with the opening scene showing T’Challa going after former lover Nakia. Having an issue like slave trafficking being tackled in the first ten minutes set the tone for the rest of the film. It would be the first of many moments addressing issues within and outside of Black culture in an unfiltered, uncomfortable manner. I cringed a few times at the “kitchen table” talk being addressed so bluntly in a room with a mixed crowd. There was the tension between African Americans and Africans. The moment where Erik Killmonger confronts T’Challa in the throne room about their shared familial secret hit me in a way I didn’t expect. In that moment, I sided more with the villain than the hero as I thought about the hip-hop Pan-African movement where Black artists were talking about going back to Africa. While I was excited by the idea as a child, the adult me felt like I would be an unwelcomed outsider. I may be of the African diaspora, but it was my own people who sold my ancestors to colonizers and let them suffer for 400-plus years. I understood the anger and distaste Killmonger had for T’Challa and Wakanda when people with power do nothing to help their own. At the same time, Killmonger’s y’all-owe-me-something attitude fed into the archetype many Africans see in their American brothers and sisters. Erik’s and T’Challa’s different outlooks on Wakanda’s place in the world spoke to the disconnect between two segments of the same diaspora. Along with tackling the oft-unspoken tension between Black Americans and Africans, the film also had plenty to say (and show) on the topic of the colonialist exploitation of African resources. Watching the scenes with Klaue made me uncomfortable yet angry at the same time. Growing up in America, I was aware of my history (even if it was only taught once a year). Seeing the greed in Klaue’s eyes every time he spoke about vibranium and Wakanda gave me a peek into the mindset Europeans must have had while robbing civilizations of their rich cultures and abundant resources to make their countries wealthier. Watching this personification in a 21st-century context gave me chills thinking about the monetary gain and control Klaue wanted even if it meant exposing picturesque Wakanda to the world. What hurt me, even more, was watching Killmonger team up with him for understandable yet selfish reasons. I’ll admit that part made me dislike Killmonger for most of the film as he worked with a bigot to exploit his own people—something Black people still deal with when reconciling certain figures in Black culture. But at least Klaue met a fate deserving of a bigot. With the heavy stuff out of the way, Black Panther did something people rarely ever see on screen—it showcased Black women in a positive light. Throughout my life, I have seen Black women portrayed as either the angry woman, the ravenous jezebel or the tamed mammy. There have been some exceptions, but they’ve been few and far between. It was nice to see Black female empowerment front and center of a film meant for general audiences. Seeing the celebration of so many different aspects of the Black woman was a great tribute to the backbone of Black culture. I felt pride watching the Dora Milaje, Nakia, Okoye and Shuri take on Killmonger, W’Kabi and the Border Tribe in the finale fight. Those three ladies functioned as the personification of brains, brawn and duty. Even with a strong female presence, good old patriarchy popped up in the form of M’Baku. Every scene he was in with Shuri was like watching the high school quarterback tease the valedictorian because she doesn’t follow social norms. But it was the women in the end who pushed the nation into its position within today’s world. I walked out of the theater feeling like this already $200 million-plus Marvel phenomena, with Black creators both in front of and behind the camera, was a wakeup call. Too often Black culture has been undermined, underappreciated and undervalued. The time is now to show not only Hollywood but the world that Black people are just as important as anyone else in advancing society’s narrative.